The tick tick tick of the car’s cooling engine dragged Arthur back to his surroundings with a rush. The sky was cornflower blue, the only movement a honking arrow of geese skirting the horizon. He squinted against the bright summer light, his face cooled by a gentle breeze that disturbed the smoke hazing the air. A fly crawled across his face, tasted the sweat beading on his skin, before he swatted it away. He looked down at his hand resting on the hood of his car. He felt the heat bite deep into his hand, the pain distant, happening to someone else. He idly fingered a small dent marring the otherwise glossy, satin finish. Such a small thing, his mind wondered, such a small thing with large… He looked up sharply and the reality of his situation fell on him like a ravening beast, seizing his throat in a choking grasp that left him dizzy and breathless. 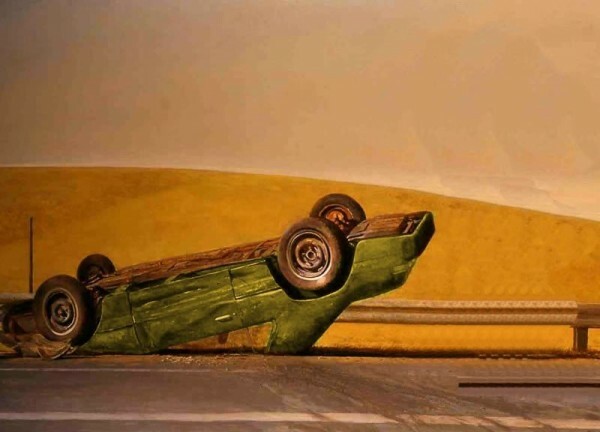 A little up the road, lying on its roof was a late model Mini, as helpless and useless as an upturned beetle. Scrapes and gouges in the paint work and battered panels robbed it of its graceful lines. Wisps of smoke spiralled into the air from its shattered engine and petrol leaked in a spreading, acrid pool. One of the front wheels rotated hypnotically. He looked down again and watched his thumb rub against the dent, paint from the Mini sifting to the ground like snowflakes, the breeze scattering the tiny dots into invisibility. Now no one will know you were here, a voice whispered to him. Guiltily, he looked up and down the road. A part of him was glad to see it was empty. The road was a narrow bitumen gouge stretching back into memory and forward into the unknown, surrounded on both sides by verdant, empty pastures. Above him, a contrail inched across the Spartan sky. Far above, there were other lives still with endless possibilities. No reason why you can’t have it to. That voice again, more insistent, confident. Arthur shook it off, his gaze falling on the wreck again. Something twisted inside his chest. Reluctantly, he walked over to the car, shoes crunching heavily on cubes of shattered glass. Within him grew a sense of expectation, like the hands of a clock frozen between the tick and the tock. He felt like a soldier unlucky enough to catch a grenade, frantically juggling the metal grapefruit as his mind screamed. A tipping point neared, one that would push him over the edge and send him plummeting into a life that would insistently demand answers every day of the rest of his life. Unless…sinking to his haunches he stared through the driver’s shattered window. The woman, her long blonde hair thick with blood, was very obviously dead. One side of her head pressed hard against the ceiling, the other lay neatly tucked against her twisted shoulder. Her eyes were open, caught between blinks. Numb, Arthur tilted his head and looked in the back seat, relieved in some, small, inadequate way to find it empty. The fly returned, zooming through the window. It landed on the woman’s face and walked across her pale skin, entered a nostril. It didn’t emerge. Bile wormed into his mouth and Arthur swallowed hard against it. He felt the clock’s hands trembling, ready to resume their endless turning. The tangle of keys gripped tightly in his right hand reminded him of other, impossible thoughts. Flight. Freedom. He turned to look at his car, the earlier absurd thought taking root. Could he? Movement from the wreck snagged his attention. The clock sprang back into life, the ticking a clangourous tolling. He saw the woman’s head shift minutely. Then her eyes fell on his. He jerked forward, appalled at the idea of having to help her, to cradle her head while he dragged her shattered body clear. Then her mouth opened and blood poured out, a glutinous stream that filled her nose and spilled into her eyes, turning her face into a glistening, lacquered mask. The echoes of a scream followed his mad scramble back to his car, numb fingers fumbling at his keys. The engine roared, then coughed, petrol flooding it. Terrified that it would stall, Arthur eased back on the accelerator until the engine ran smoothly. Then he slammed it into gear and sped off, wheels squealing for purchase, the car threatening to careen off the road and into the ditch. Once in control, Arthur glanced into the rear vision mirror, the sliver of reflection juddering from the haste of his departure. In it, he saw something emerge from the dead driver’s window, something white and torn, led by bloody, shattered fingers clawing at the bitumen. Sobbing, he flung his hand up, knocking the mirror askew. Several hundred yards further on, the car slewed to a halt in a pall of acrid smoke. The driver’s door flew open and Arthur fell onto the road, scraping his hands. He retched violently, again and again until his stomach was empty and a thin line of bile hung from his numb lips. He became aware of the stinging in his grazed hands and clambered unsteadily to his feet, leaning against the car for support. A shimmer of heat blurred the distance. The air was still and the hum of insects ate at his self control. He felt his pulse quicken through his body, at throat and groin, while he tried to ignore the thoughts tugging him. Guilt. Contrition. A distant memory of his first confession. Expiation. He looked down at his suit, thoughts of work coming to him. He thought of his family and the words dwindled in a torrent of self pity. Straightening, he smoothed his pants and tugged at his shirt cuffs, the old, familiar actions steadying him. Shaking his head, he turned to get back into his car when a flash of yellow left him breathless with fear. Visible as a yellow glow through the haze, the shattered Mini had somehow righted itself. Arthur’s heart hammered a frantic tattoo. The engine revved, a thin twisting noise that reached him like the warning buzz of a swarm of wasps. ‘No.’ The word sounded like a prayer. Jerking into motion, the Mini accelerated until it moved from nightmare to hard reality. Its yellow paint looked scabrous, like cream gone bad in the sun. The car wove from side to side, a hunter scenting its prey. Arthur’s hands fluttered like doves at his open door, trying to gain purchase on the hot, smooth metal. Panic filled him with a desperate, suicidal urge to leave the road and make for the fence, to run free and wild in the cropped grass while the yellow car howled impotently from the road. But then the Mini’s speed dropped until it drew to a halt some twenty feet away, the engine rumbling quietly, a lion’s throaty, globular grumbling. The sun, standing directly overhead, rendered the front window mirror-bright, hiding the interior. Arthur blinked against the sweat stinging his eyes and tried to focus on the figure he could see resolving into view from out of the hard, brittle glare. An anguished moan emerged from his mouth, threatening to unmoor his sanity. Broken hands gripped the wheel, blood oozing from the cuts and grazes fouling them. Twisted body, neck slumped and canted to one side. Torn lips stripped away from shattered, carmine stained teeth which snapped and tore at the purpling tongue. But it was the eyes that snared Arthur, which sent him screaming into his car, putting as much distance between himself and his guilt as possible. And all the while during that maddened escape, the memory of those eyes followed him. Eyes of shimmering darkness, staring with unplumbable hatred right into his shuddering heart. Arthur watched the road through twitching curtains, television mumbling incoherently to itself. Outside, the ripe, heavy air buzzed with insects and a sense of anticipation that wormed its way into Arthur’s fidgeting mind. Beside him a wardrobe stood drunkenly to attention, leaning over a sagging bed. A tap dripped incessantly in the narrow bathroom, chipped tiles sweating in the humidity. Light humped and swelled against the walls, a grey tide projected by the stuttering television. A fan swung desultorily to and fro, shifting the heat from one corner of the room to the other. From another room, he could hear music rise and fall, an exhausted party slumping to a finish. Arthur didn’t think he would sleep tonight. The motel’s red neon sign flickered intermittently, rendering bloody the slick driveway. The office was just visible, as was the silhouette of the night manager, a grandiose title for the obese, cigar chewing man reeking of cheap bourbon who had checked him in earlier in the evening. Arthur spared a glance at his watch. Just on ten. A shadow fell across him and with a soft curse he saw that the neon sign had been doused. The lights in reception winked off. The cigar’s cherry red tip moved through the dark before vanishing. He sensed the motel grow more isolated, lost in a slow moving whirl of shadow and the soft chirruping of insects. Arthur’s grip on the curtain tightened until it tore. Unbidden, the face of the dead woman swamped his thoughts and he shot to his feet, staggering away from the chair and fighting his way through a storm of ghostly images into the bathroom. The distant, coughing roar of a prime mover gearing down as it approached the town filled the room, the rumbling shaking the windows. Unsteadily, he filled a glass from the battered tap, watching the fine sediment swirl to the bottom. Grimacing at the metallic bite, he swallowed a mouthful and looked up at the mirror. Haunted eyes set in a pale, sweat-grimed face stared back. He touched his check, probing at the panic lurking under the skin. Dark smudges under his eyes seemed to expand as he looked, threatening to swallow his face. Shaking his head, Arthur set the glass down. A car engine rumbled outside his door and his heart stopped. In the mirror Arthur saw a stranger staring back at him, someone whose face had gone white and was best b tics and tremors. ‘Enough.’ Anger shot through him, anger at himself and the thing outside. Anger loosened terror’s grip and sent him striding the short distance to the door. His hand touched the handle and his bravado bled away as abruptly as it had welled within him. He pressed his face to the door, wide eye almost touching the peephole. He seemed to be looking through a tunnel, the thick glass rendering the image in cramped, hallucinatory strokes. His car was a shadow glimmering like mercury where the dim light struck it. And out on the road, a distant speck of yellow sent a chill through him. Gritting his teeth, he opened the door and stepped outside. The air was thick and still. Sweat prickled across his face and shoulders. Music thumped from the room further up the walkway, light spilling through an open door. A glass shattered and an exhausted jeering went up. The driveway glimmered under the light of a fat, yellow moon sailing through a checkerboard of tattered, scudding clouds. And the car, always the car. Parked hard up against the kerb, the car sat under a street light, the sodium haze casting the interior into deep shadow. Brake lights shed a bright, red smear on the wet road, and the engine throbbed quietly. Trembling, feeling an edge of hysteria sharpen with each step, Arthur approached the car, ready to run at the first side of trouble. A voice begged him to turn and run anyway, that nothing good would come from this, that this wasn’t brave, this was madness. He ignored it. A door cracked open. A hand, rendered like tallow fat in the light, slowly emerged. He stumbled back, knuckle jammed into his mouth to stop the scream surging up his throat. A booted foot and then a length of long, long leg emerged, topped by a black mini skirt that revealed more than it covered. One hand tugged on the skirt while the other clutched a small black bag. Her breasts were barely restrained by a tight cropped top, and Arthur watched with a sense of disbelief at the man in the driver’s seat, lighting up a cigarette while the women approached him. ‘You called for a stripper?’ Her voice was like a cat’s yowl, broad and loud in the night. He shook his head, mute with relief. She looked passed him, attention drawn by the music. She winked at him, strutting by with a kick to her hip that sent a pulse surging through his heart. Relief sent him reeling back to his room. He closed the door then slid to the floor, sobs wracking his body. Outside, the music swelled and Arthur allowed himself to sink into it. He woke only once during the night, to the distant sound of a rumbling engine and the shriek of tearing metal. The next day, Arthur went about his business with a weight off his shoulders. Heartened by a freshening breeze and the bright sun, he put the day before down to overwork and a guilty conscious. Sure, he had left the scene of an accident, but it was hardly…no, not his fault at all. There was nothing to be done but get on with life. And if he had seen and heard some things, well, he had been working too hard after all. The boss’s sales numbers were crazy and all that stress could do strange things to you. Yes, today was going to be a good day. Warmed by the memory of his encounter with the stripper, Arthur went about his day as he would any other on the road. He met all his appointments, glad-handed the purchasing managers and generated the sort of sales head office was sure to be impressed by, and then treated himself to a decent counter meal at the local pub. He even amused himself by grabbing a holiday brochure from a travel agent. Whistling jauntily while he walked back to his carn, he marvelled at the wide and blue country sky. Consulting his map, Arthur grew confident he could make the long trip to the next town in fair time. Halfway there, along a narrow ribbon of highway, a police car pulled him over and the terror returned, as sour and rank as day old vomit. Arthur locked his fingers around the steering wheel to control their trembling. His mouth worked silently, eyes sliding from the side mirror to the open road ahead. The thought of racing away in a cloud of gravel clawed at him. With a groan, the door of the police car opened and a tall officer in blue stepped out. Adjusting his hat with one hand and reaching for a notepad with the other, the officer strode towards Arthur. One thought swept dizzyingly through Arthur’s head – survival. Survival at all costs. And to survive, he would have to lie like he had never lied before. He would joke and laugh to put the officer at ease, to ensure that his curiosity at the dent in the car wasn’t piqued so much that he started asking awkward questions. Lying Arthur could do, lie and lie and lie and lie, just so he could get home and be with his family and close the door on the world. There was a rap on his window and Arthur jerked into life, frantically winding down the window. ‘Afternoon, officer,’ he managed, the words catching on his tongue. He fumbled in his wallet for his licence, fingers as heavy and as stiff as concrete. Looking up, he caught a glimpse of the officer’s name tag. Hendriks. ‘Afternoon, sir.’ Plucking the licence from Arthur’s fingers, the officer bent for a closer look at him. Police issue sunglasses hid his eyes, and Arthur felt himself seized with a fear that Officer Hendriks knew everything that had happened and no amount of lying would stop him dragging Arthur from his car. Those hidden eyes scrutinised the licence and Hendriks made notes, the scritch scritch of his pencil filling Arthur with dread. With rising terror, he saw that his free hand, the one not knotted to the steering wheel, had begun to reach for the keys. ‘Any reason you were speeding, sir?’ The hand twitched, then fell. Arthur looked at it in wonder, this limb of his that had taken on a life of its own. ‘Speeding?’ He just managed to get the word out, his attention fixed on his flexing fingers. He looked up at the officer and fixed a winning smile on his face. His voice trailed away. He caught a glimpse in his rear vision mirror of a yellow smear that jolted him in his seat. A rumbling noise filled the horizon from one end to the other. Hendrik’s paused in his note taking. He leaned forward, sniffing. The rumbling rose sharply into a banshee wail, a shrieking that was matched by Arthur’s own. In his side mirror, the yellow car surged forward. A blast of wind rocked his car, taking the officer away with it. A billowing cloud of dust and grit filled Arthur’s car. Through slitted eyes, he saw Hendrik’s body describing an arc through the air, slowly rising and twisting and falling like a rag doll tossed across a playground. Flying more than thirty yards, the body smashed into the scrubby grass lining the road, a tangle of arms and legs that bounced once, then slithered to a halt. Beyond the prone body, the Mini came to a stop in a cloud of dust. A terrible truth flowered in Arthur’s mind. With sharp-edged petals, this realisation scoured all other thoughts away and sent him staggering from his car. Through aching eyes, Arthur looked at the Mini. A broken backed shadow lurked within. The engine’s dull throb matched his heart’s jerking rhythm. By the road, the withered grass rasped in the breeze, curdling his thoughts. Reeling like a drunk, he stumbled toward the car. A trail of blood marked his way, droplets of rusted pennies leading him from one life to another. With each step, he felt his previous life slip away in a cascade of fragmented memories. Samples and records and receipts. Appointment and orders. His wallet sitting in the front seat, choked with the tokens of his identity that no longer made any sense. Passed Hendrik’s shattered body, a crumpled confusion of clothing and flesh. The gravel crunched like broken teeth under his feet and then his hand settled on the handle of the front passenger door, the metal ice-cold to the touch. He looked up at the sky, a shattered bruise of cloud and fire, the sun beginning its descent towards the horizon. The door swung open and he stepped inside, all resistance bleeding from him. As he settled into the seat he felt her glittering eyes fix on him and the truth that had come to him before broke like a wave again, washing everything away. No matter what he did, no matter where he went, she would always be with him. This story reminds me of the film “Carnival of Souls” and the Twilight Zone episode “The Hitch-Hiker”. Not sure what inspired the story, other than an initial image of a man standing by his car looking at a wrecked vehicle up the road. From that image the story bossomed. I’ve seen The Hitch-Hiker but not Carnival of Souls. Was my story a decent read? IVivid and strong on atmosphere. I really liked it.